Sod installation is a fast way to improve the look of your lawn. You can enjoy a lawn of instant beauty and maturity without the usual time-consuming hassles of seeding. 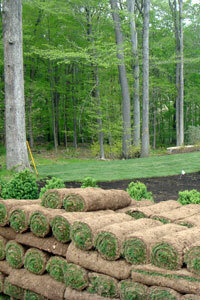 We offer sod installation services that are friendly, fast, and most importantly, done right the first time. It is our goal to provide our customers with the very best product available, delivering that product in a timely manner, and providing professional installation when applicable. Our sod installation crew members will completely remove an existing lawn that is in disrepair. We will grade, final rake, install the new turf and roll to completely lift the appearance of your home and yard. Click here to read more about Sod Installation Service. Call us to arrange a meeting.